"The songs are about friendship, adventure, horses, trying your best, and having FUN! It's full of great pop music and there are karaoke versions included as wellso grab your hairbrush and sing out loud!" Music Updates: The Saddle Club: Secrets and Dreams is due for realse on April 11th with its single Undercover Movers and Shakers (Undercover Movers and Shakers [The Saddle Club], Today [Lisa], Boys [The Saddle Club], Undercover Movers and Shakers [long version]). The Sydney Royal Easter Show opens on April 2nd and with it comes The Saddle Club Arena Show feauting all your old favourites and some new ones to! 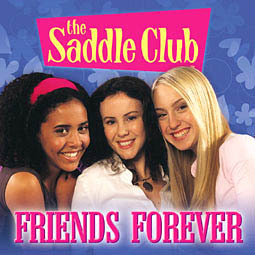 The 50-minute feature show stars all your favourite Saddle Club characters. See www.easter-show.com.au for more details. Keep checking for more pictures from all recent tours! The Saddle Club hit the music indurstry with their first song, "Hello World" by popular demand after it was featured with the end credits of the show and they've been booming ever since. "Hello World" did so well on the charts that the big money making people that we never hear about decided to get the girls going with an album, what else could the fans want? "Fun For Everyone" was realased in late 2001, and went gold after 3 months in stores, that means it sold over 35,000 copies! 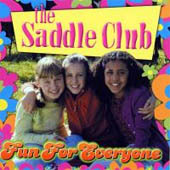 Saddle Club on "Fun For Everyone", in fact it was sung by two of the youngsters, Ashley and Melanie. The producers and obviously the fans loved it so much that soon everyone was singing it, and was soon it had sold over 50,000 copies on a single with "Hello World"! They kept on rolling with a realse of a second album, "On Top Of The World" which has hit gold with a little help from their 2003 promotional tour. To follow "On Top Of The World" was the series two favourite "Wonderland". Lisa, Carole and Stevie took the chance when they had it to sing at their favourite hangout, JB's on screen. The viewers loved it so much they had to hear it live at shopping centers across Sydney and Melbourne. Now after the hit of Wonderland a third album is expected to follow along with to more singles! Q. How did the saddle club girls become involved in making the albums? Q. 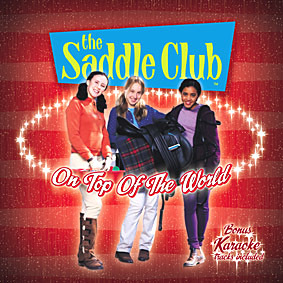 The Saddle Club has been a very popular TV show and its theme song Hello World became very well known with the fans. Is music an important part of the TV show and how is music used? A. After the response to Hello World, we decided to make the singing part of the storylines. Keeping in mind that the show is about the girls' friendship and their love of horses, we didn't want it to become a 'girl singing group' show but we knew the interest was there from our audience. David Williams from Shock had a talented group of young composers come up with potential songs for the series and together with our editor, Bob Sprogis, we chose those appropriate to the drama (and some of course that were written specifically for a particular episode) as background Music and several times we used the girls singing on screen. One of our characters talks the girls into performing as a group at the local café and we got a terrific sequence out of that. And of course the girls loved the experience of recording the songs and performing them. Q. What do you think saddle fans will enjoy about the saddle club albums? A. We found from series 1 that our audience records the episodes and watch them over and over. The songs add to their enjoyment and judging by the fact that most mothers of girls aged between 4 and 8 can sing Hello World and Hey Hey What You Saythe songs on the show and the follow up albums have been very successful.